“I need your help.” The text comes through just before dawn and the desperation flows from the blue screen. It is a friend with a family member battling mental illness. “Do you know someone who can help?” she asks. With confidence I write, “yes” and send along the name and number of an excellent psychiatrist I know from my own training as a psychiatrist at Yale. Now months later, they report he has been a godsend, juggling complex medications, and providing much needed therapy. They are in good hands, with someone relatable, and an expert at his craft. However today, the assurance of safe, high-quality mental health care in Connecticut is at risk: SB 966 has been raised in Connecticut’s General Assembly (CGA). This bill would allow psychologists to prescribe medications. Why is this alarming? It helps to understand the difference between a psychiatrist and a psychologist. A psychiatrist is a physician first. As a medical doctor, a psychiatrist must undergo the pre-medical and medical training that all physicians do. What does this training entail? As an undergraduate, they must build a solid foundation in the sciences, with courses in biology, chemistry, and physics, in preparation for the rigorous medical school entrance exam, the MCAT. They spend four years studying the pathophysiology of the whole human body, including all organ systems, and follow patients in on-site clerkships under close physician supervision. After obtaining an M.D., the physician spends another four years in a psychiatry residency training program, learning the intricacies of the brain and human psyche. During residency, they work with patients in the emergency room, hospitals, and offices with supervision by physician experts. After spending months on general medicine and neurology services, they spend years focused on psychiatric patients. In all, psychiatrists will spend over 20,000 hours in medical training prior to certification as a psychiatrist. In contrast, psychologists are awarded a PhD or PsyD, and are not medical doctors. A psychologist’s college requirements are a statistics math courses and human behavior classes. No other science background is required. After college, where they can major in any subject, they take the GRE, which tests verbal and math reasoning, and writing skills. In graduate school, which typically lasts four to six years, the training varies, but in general, the focus is on learning about different types of therapy and how to administer psychological tests and other evaluation tools. Most get one course focused on psychotropic medications. In sum, psychologists receive very little, if any, medical training. 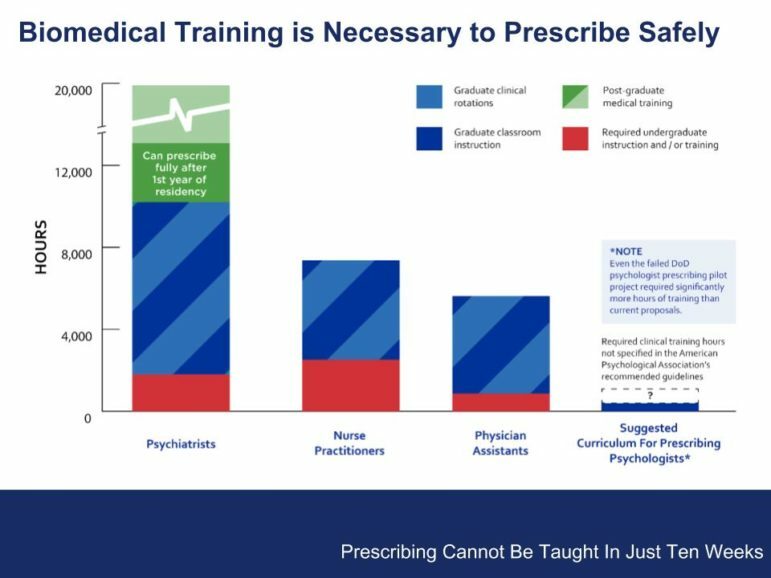 SB 966 would permit psychologists to prescribe medications after taking a 400-hour online class, and supervision by an MD, or APRN for as little as 1,000 hours. The details around this supervision are vague, and might be only an observation experience. Is it fair to compare 12 years of medical instruction to less than a year with just 10 weeks of an online course and 25 weeks of patient contact? 20,000 hours vs. 1,400? Today, the psychologists’ lobby is persuading legislators in Connecticut to hand over prescriptive privileges to people with minimal medical training. They are pushing a bill that would allow an online course and a few months of shadowing to be the only preparation necessary to prescribe powerful medications for people struggling with mental health and substance-use diagnoses. People’s mental health cannot be separated from their physical health. Half of all people with mental health disorders also have physical illnesses. Medical training is vitally important to be able to prescribe medications safely and effectively. Would you want your elderly parent struggling with memory issues, depression and heart disease to be treated by a well-meaning person with no medical background who took a short online course on medications? Having been the caretaker for my grandmother who suffered with these illnesses, I would not. Should this already vulnerable population of Connecticut residents be shunted into a system of care by people who lack substantive medical training? If psychologists want to prescribe, we already have a solution: they can attend an accredited two-year Physician’s Assistant (P.A.) or a three-year Nurse Practitioner (NP) program and obtain the necessary medical training to safely prescribe. In Connecticut, we have excellent accredited programs for both. Make your opinion known to the members of Connecticut’s Public Health Committee member TODAY. They may vote on this issue within days. Contact your state legislators by email or phone and tell them to oppose SB 966. 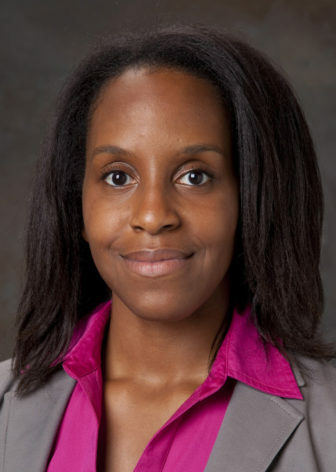 Dr. Tichianaa Armah practices in Stamford.